Want to Buy your Smeg Blenheim 90 cm Dual Fuel Range Cooker later? Combining style and quality, this Smeg Blenheim 90 cm Dual Fuel Range Cooker will make a stunning statement in your kitchen. Stylishly designed in silver with black and chrome trim, this Smeg models exclusive aesthetics with superb quality and an unmistakeable look that will make this appliance a fantastic centrepiece in your kitchen. Spacious cooking room Equipped with a 61 litre multifunctional main oven and a 62 litre second auxiliary oven, this Smeg range cooker offers full and half grill functions plus conventional cooking, providing a versatile second oven and separate grill compartment. Perfect if you're rustling up a large roast and need to use various temperatures and cooking methods. The 35 litre separate grill offers both full width and half grill functions, so you can grill a single portion of fish for a healthy dinner or make the entire household bacon sandwiches; always using only the energy that you need. You can also use this additional space to heat up your dinner plates or cook your starters while the main and dessert are in the other ovens. Convenient cooking and cleaning Featured inside both oven cavities, the easy clean enamel liners make light work of wiping away grease and food residue. You can keep the range cooker in top condition and all with minimal maintenance or elbow grease. The highly effective circulaire cooking system utilises hot air, allowing you to cook different types of food at the same time and using various shelf positions. This reduces cooking times and prevents flavour transfer between foods. Easier access The side door opening system gives you easy side access that allows you to get closer to the oven, making it easier to get to and check on your food. The telescopic shelf guides make it safer for you to check on or remove your food from the oven, so you're at less of a risk of burning yourself. Perfect for larger households and those who are passionate about cooking, this Smeg BM93P 90 cm Dual Fuel Range Cooker is a strikingly stylish choice. How to buy Brand New Smeg Blenheim 90 cm Dual Fuel Range Cooker through Phone Retailers? Phone Retailers compare prices of Smeg Blenheim 90 cm Dual Fuel Range Cooker with hundreds of retailers. You simply need to select the best price of Smeg Blenheim 90 cm Dual Fuel Range Cooker from one of the retailers. Once you have found the cheapest price for Smeg Blenheim 90 cm Dual Fuel Range Cooker, proceed on to the seller's website to complete checkout process and make payment online for Smeg Blenheim 90 cm Dual Fuel Range Cooker. Complete the checkout process for Smeg Blenheim 90 cm Dual Fuel Range Cooker and wait for delivery of your order. Make sure someone is available to sign for your delivery. How to find out the best deals for Smeg Blenheim 90 cm Dual Fuel Range Cooker? We list the retailers based on their price offer for Smeg Blenheim 90 cm Dual Fuel Range Cooker, reviews, ratings, delivery time and method. You can select the retailer suited to your preferences. Can I compare Smeg Blenheim 90 cm Dual Fuel Range Cooker prices online? What is the cheapest offer on Smeg Blenheim 90 cm Dual Fuel Range Cooker? Cheapest Price of Smeg Blenheim 90 cm Dual Fuel Range Cooker today is £1249.00 offered by Currys PC World whereas the highest offer is £1249.00 by Currys PC World. You can save approximately £0.00 when you buy Brand New Smeg Blenheim 90 cm Dual Fuel Range Cooker. Can I buy Smeg Blenheim 90 cm Dual Fuel Range Cooker and pay online? How long will it take to get my Smeg Blenheim 90 cm Dual Fuel Range Cooker delivered? Shipping methods and delivery time is different with each merchant. You can check on Smeg Blenheim 90 cm Dual Fuel Range Cooker listing next to the retailer, their dispatch time and payment methods. Is it safe to buy Smeg Blenheim 90 cm Dual Fuel Range Cooker online? We can assure that it is totally safe & secure to purchase Smeg Blenheim 90 cm Dual Fuel Range Cooker online with Phone Retailers. The retailers affiliated with us are verified and trustworthy. How to get the best price for Smeg Blenheim 90 cm Dual Fuel Range Cooker and choose the best retailer selling it Online? I want to buy a brand new Smeg Blenheim 90 cm Dual Fuel Range Cooker. How much can I buy it in Brand New condition for? Currys PC World and 0 other retail is selling Smeg Blenheim 90 cm Dual Fuel Range Cooker for as low as £1249.00 in brand new condition. You can also check the price for refurbished Smeg Blenheim 90 cm Dual Fuel Range Cooker. 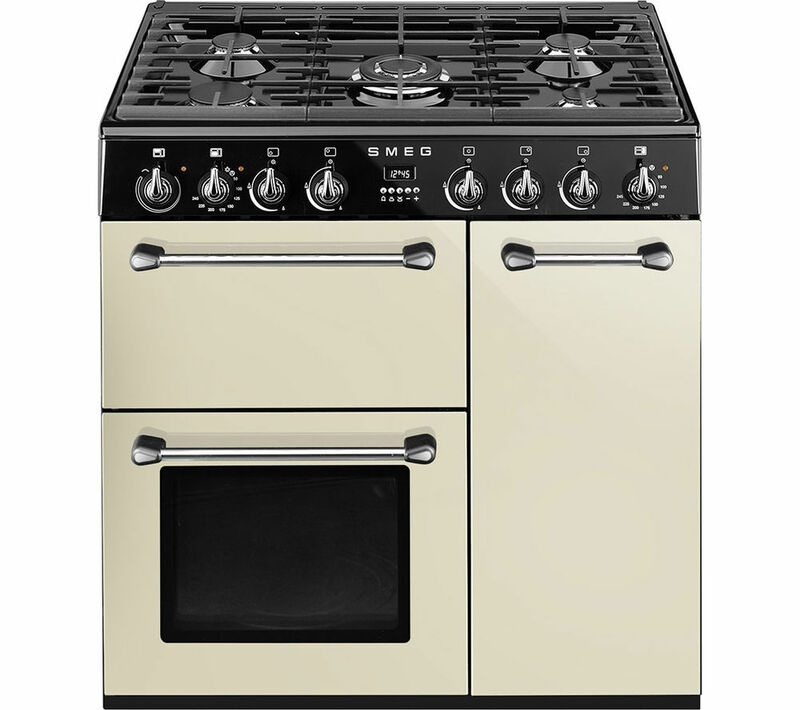 How many Smeg Blenheim 90 cm Dual Fuel Range Cooker can I buy in brand new condition online? You can check on retailers website to see how many brand new Smeg Blenheim 90 cm Dual Fuel Range Cooker they have in stock and order Smeg Blenheim 90 cm Dual Fuel Range Cooker directly on their website. How easy is it to buy a brand new Smeg Blenheim 90 cm Dual Fuel Range Cooker through Phone Retailers? It’s a very simple process, we compare you the best prices for a brand new Smeg Blenheim 90 cm Dual Fuel Range Cooker so that you can check how much does it cost online. Once you choose the most suitable retailer, all you need to do is add Smeg Blenheim 90 cm Dual Fuel Range Cooker to the basket and complete their checkout process to place an order. What stores are selling Smeg Blenheim 90 cm Dual Fuel Range Cooker in brand new condition? Retailers like Currys PC World, offers best retail prices online for Smeg Blenheim 90 cm Dual Fuel Range Cooker. You can buy it for as low as £1249.00 online in brand new condition.